Waiting for visible signs of distress to appear on concrete structures is a very expensive method of maintaining a structure. Concrete repair cost by this stage can be astronomical (especially when costs to take the structure off line are included). Corrosion monitoring allows the corrosion to be caught before its onset and opens up much more economical maintenance options such as coating etc. By installing Corrosion Monitoring probes during construction the health of your structure can be monitored. 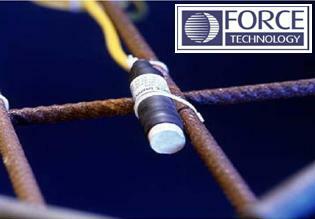 These embeddable Corrosion Monitoring probes are installed during construction. They use Linear Polarisation to return a microns/year of corrosion rate. Systems can be monitored remotely whilst handheld control systems can collect data from installed and surface probes. Adding this type of monitoring in the design stage is becoming very prevalent and two examples of where it is being specified or has been installed are the Sydney and Gold Coast Desalination plant. Additionally maintenance of major infrastructure where accessibility is minimal such as diaphragm walls or capped piles can be considerable enhanced. Half Potentials are a highly useful tool for the inspection of corroding structures. However very often the splash/tidal zone is saturated and negative results only indicate oxygen starvation. Using LPR measurements on these structures are much more useful for the corrosion consultant. The ERE 20 is a true, long life Reference Electrode, which can be cast into the cover concrete to check the cathodic protection and to monitor the corrosion state of reinforcing steel or predict corrosion. Normally in newly cast concrete structures, but the electrode can also be installed in existing structures. The CorroWatch acts as an early warning system to predict the initial stages of corrosion in concrete structures. It is cast into the cover concrete, normally in newly cast concrete structures. The sensor can measure most of the relevant corrosion parameters. The CorroWatch is a multi-sensor, which in the standard version consists of four black steel anodes and one noble metal cathode. The anodes are placed in varying, but defined distances from the exposed concrete surface. 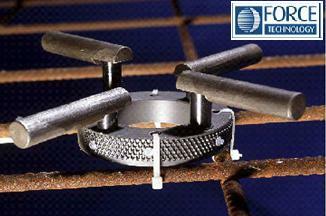 The height of the anodes is flexible and can be adjusted according to the concrete cover thickness. By measuring the corrosion current and also electrochemical potential in different depths in the concrete cover it is possible to predict when the corrosion should reach the reinforcement and thus prepare the necessary maintenance measures in time before the damage occurs.